Neil Maldonado-Catinchi, M.D., earned his Bachelor of Science degree from Interamerican University in San German, Puerto Rico. 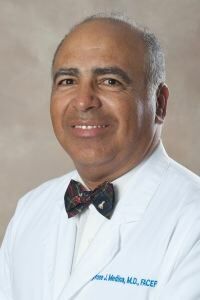 He earned his Doctorate in Medicine from San Juan Bautista School of Medicine in Caguas, Puerto Rico. He completed his medical internship at the Hospital Auxilio Muto in San Juan, Puerto Rico. Dr. Maldonado is board certified wound specialist completing his wound care education in Plainfield, Illinois. He is proficient in both the English and Spanish languages. ​He has been treating patients for over 16 years. Dr. Maldonado welcomes you to his new location in Naples, Florida. Tammy Calamari graduated from the Physician Assistant program at the School of Allied Health at Stony Brook, New York in 1992. Tammy went on to practice in the field of Emergency Medicine for 3 years in NY before relocating to Naples, Florida in 1995. She practiced in the Emergency Department at Naples Community Hospital from 1995 until November 2011, then took a position at the Naples Medical Center, where she currently resides today. Tammy is NCCPA board certified.